In 2005, Category 5 Hurricane Katrina slammed into the Eastern Gulf Coast, causing destructive and fatal floods in New Orleans, LA. Residents who were lucky enough to seek refuge outside the city were faced with the difficulties of life away from the comforts of their homes. One resident, Dera Duplessis and her family were lucky enough to evacuate the city, but the challenge of keeping her family away from hunger soon faced her. Dera and her family fled to the safety of a hotel in Texas. Although they were safe from the ravaging of Katrina, the economics of sustaining her family was a daunting task she had to face. The most convenient way to getting them fed would be to run to eat out, given that they had no kitchen to prepare their food in. With 5 hungry mouths to feed, spending what little finances they had on food was out of the question. She had to figure out a way to keep them fed not only in the aftermath of the storm, but all throughout the hurricane season: pickling and preserving. Dera pickled anything she could so that her family would have enough in store. “I had pickled vegetables, my jams and soups… anything that I could make,” she recalls. Her system was so effective that she made preserves and pickled vegetables in the years after Katrina partly to prepare for the unexpected and partly because she actually found pleasure in doing it. This pastime of hers, more than 10 years after that deadly hurricane, paved the way for her to be able to help and give back to her community. After her retirement from her job as a hospice nurse, emptiness crept inside her. She wanted to do something else and felt that there was something missing which made her wonder what was in store for her. By chance, her sister mentioned Sprout NOLA, a neighborhood garden in her community that was started by the Green Garden Giveaway by Garnier and TerraCycle. Picnic tables and garden boxes fashioned out of recycled materials plus cash funding were given away to deserving districts to help start gardens that the locals can share and use. 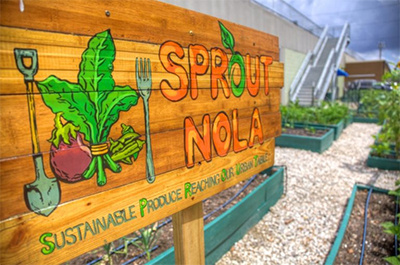 Sprout NOLA was one of these gardens that has brought neighbors closer, serving as a place of congregation and offering vegetable and free garden plots to the locale. Dera remained skeptical at first, doubting her ability in growing things, being more of handy-woman type rather than the gardener type but, with encouragement from her sister, she decided to give it a try and was quite admittedly surprised that she loved it. Her skills in making her own jams, spreads, soups and pickled produce using fresh vegetables from the garden gave her a purpose and even went on to sell her new and interesting products at local farmers markets. Products now infused with herbs and plants she had only discovered when she joined Sprout NOLA. “I actually tasted the flower (hibiscus) and all,” she relates. “I did not realize it tasted so good.” The thought of eating a flower never occurred to her, but so was the thought of actually growing things in a garden. Other than being merely a newfound hobby and enterprise, Dera’s skills in gardening and food preparation have been the instrument by which she gives back to her community. The lack of fresh food has been evident in the low life expectancy rate in neighboring areas: age 55. This, according to Sprout NOLA coordinator Emily Mickley-Doyle, is why fresh, healthy food is critically needed in communities such as Dera’s where majority of people are suffering from health related issues from consuming fast food. Part of the resistance to cooking fresh and healthy is the notion that cooking from scratch takes too much effort and time. But her experience with food preparation has given her the chance to show her neighbors that it can be done, especially if they supported one another in achieving the goal of healthier living. She also realized how the earth gives back, be it in the form of food, or the oxygen the plants share with us, which makes it important to care for the earth as well. This is why everything in the garden has been utilized in full. The picnic tables created by Garnier and TerraCycle are made from recycled bottles while the garden boxes are made of sturdy recycled lumber that can last for a long time. Dera Duplesis believes that it isn’t just the skills she has that made this garden successful for 4 years now. It is the immense possibilities that can be achieved when everyone works together.